How do I leave a gift to CARE International in my will? Thank you for thinking of CARE International – gifts in wills make a very important contribution to our work supporting the poorest and most vulnerable communities around the world. Please email supportercare@careinternational.org to request your FREE will writing guide or information on how to leave a gift to CARE International in your will. I'm acting as an executor. What should I do? If you are acting as executor for the estate of someone who has left a bequest to CARE International in their will, please contact our Legacy Advisor, Lauren Mander, at supportercare@careinternational.org or telephone 020 7091 6151. You may also find our guidance for executors useful. Can CARE International be my executor? CARE International doesn't usually act as an executor. Please contact our Legacy Advisor, Lauren Mander, at supportercare@careinternational.org or telephone 020 7091 6151 for more information. How will CARE International use my gift? CARE International has been working to help people in need for more than 70 years – and sadly, the need for our work is as pressing now as it has ever been. However, over time the nature of CARE International’s work may change, so it can be difficult to know exactly where and how we’ll be working when we receive your legacy gift. If you’d like to discuss any specific wishes you have, please contact our Legacy Advisor, Lauren Mander, at supportercare@careinternational.org or telephone 020 7091 6151. Yes. Your gift will help rebuild the lives of the very poorest people, those surviving in the world’s most desperate situations, for generations to come. It will allow CARE to be there, to provide food and other help to poor and vulnerable people, whenever and wherever disaster strikes. It will allow CARE to help people find their way out of poverty. We have worked alongside the most vulnerable people and communities since handing out our first CARE packages in the aftermath of World War II, when 400,000 CARE packages were sent to poor families here in the UK. It’s you that will keep that going. I don’t have a lot to leave, is it worth leaving a legacy to CARE International? Yes, any gift we receive, even a small amount, can make the biggest difference to lives around the world. If I have left a gift to CARE International in my will should I tell you? If you would like to tell us about your future gift we would love to hear from you, but there is no obligation to. If you do decide to let us know, it gives us the opportunity to acknowledge the important decision you have made. Letting us know also helps us to plan for the future and keep you informed about our ongoing work. You are free to change your mind at any time. Letting us know you plan to leave a gift in your will to CARE International doesn’t commit you to doing so. It would be really helpful though, if you tell us if you have changed your mind. Technically, yes. Gifts to UK registered charities are exempt from Inheritance Tax. CARE International would strongly recommend that you speak to a solicitor for advice on tax issues. What wording should I use to leave a legacy to CARE International? For a share of your estate (residuary legacy): I give all/a share of (please state fraction/percentage) of the residue of my estate absolutely to CARE International UK of 9th Floor, 89 Albert Embankment, London SE1 7TP, Registered Charity Number 292506, to be applied by CARE International UK for its charitable purposes, and I further direct that the receipt of the Hon. Treasurer or any other proper officer of CARE International UK for the time being shall be sufficient discharge to my executors. For a specific sum (pecuniary legacy): I give to CARE International UK of 9th Floor, 89 Albert Embankment, London SE1 7TP, Registered Charity Number 292506, absolutely, the sum of (amount in figures, amount in words) to be applied by CARE International UK for its charitable purposes, and I further direct that the receipt of the Hon. Treasurer or any other proper officer of CARE International UK for the time being shall be sufficient discharge to my executors. For a specific item: I give to CARE International UK of 9th Floor, 89 Albert Embankment, London SE1 7TP, Registered Charity Number 292506, absolutely, (write in here whatever you wish to give) to be applied by CARE International UK for its charitable purposes, and I further direct that the receipt of the Hon. Treasurer or any other proper officer of CARE International for the time being shall be sufficient discharge to my executors. 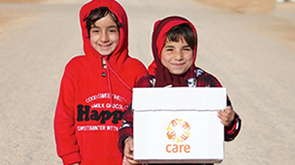 What is CARE International’s postal address and charity number? Our charity number in England and Wales is 292506.